On August 4, 2013, the 6% illuminated crescent moon (2½ days before new) joined Mercury, Mars and Jupiter in the morning twilight as seen from Borton Landing Road in Moorestown, NJ (mouseover for labels). Taken at 5:02 am EDT (59 minutes before sunrise) with a Canon EOS 6D digital SLR camera (on a fixed tripod) and a Canon 24 to 105 mm f/4L zoom lens set to 58 mm focal length. Exposed 1/4 second at f/5.6, ISO 12,800. Between 5:00 and 5:15 am, Mercury and Mars were visible with unaided eyes. Here's the view at 5:10 am EDT with the same camera and lens, except set to 84 mm focal length. Exposed 1/10 second at f/5.6, ISO 12,800. Mouseover for labels. Taken on July 27, 2013, at 5:04 am EDT (50 minutes before sunrise) at the old Pennsauken Mart site in NJ with a Canon EOS 6D digital SLR camera and a Canon 70-200 mm f/2.8L USM zoom lens (on a fixed tripod) at 108 mm focal length, then cropped slightly. Exposed 1/50 second at f/2.8, ISO 12,800. Jupiter and Mars are in the foot of Castor, one of the twins of Gemini, while Mercury is between the clouds at the bottom of the frame. Mouseover for labels. The annual memorial service for the Mexican aviator, Emilio Carranza, was held at the Carranza Monument in Wharton Sate Forest, NJ, on July 13, 2013. Click here for some more pictures of the service. On June 23, 2013, after late afternoon rain, a short (but very intense) rainbow appeared about 40° to the left of the anti-solar point (a little less than two spread hands at arm's length from the shadow of my head). A fainter secondary rainbow was also visible about 10° to the left of the primary bow (roughly a fist at arm's length). Taken at 7:53 pm EDT from Elbo Lane in Mt. Laurel, NJ, with a Canon 6D digital SLR camera and a Canon 24 to 105 mm f/4L zoom lens at 50 mm focal length. Exposed 1/160 second at f/7.1, ISO 100. Mildly adjusted and cropped in Corel PaintShop Pro X5. On June 5, 2013, a Blank Brant XII sounding rocket was launched (after a one-day delay) from the NASA facility at Wallops Island, VA, with the Cosmic Infrared Background ExpeRiment (CIBER). This suborbital flight was observed from Carranza Field in Wharton State Forest, NJ (about 135 miles from Wallops). Several images were captured with a Canon 6D digital SLR camera (on a fixed tripod) and a Canon 24 to 105 mm f/4L zoom lens set to 24 mm focal length. All of them were exposed 15 seconds at f/5.6, ISO 1600. The time stamp generated by the camera for the first image above was 11:05:17 pm EDT (the camera's clock is automatically set by its internal GPS). The camera was aimed due south and the two brighter objects above the rocket trail (which indeed looked reddish to the unaided eye) are Saturn on the left and Spica to its right (see the close-up picture below for mouseover labels). Scorpius is above the trees at the far left. Taken at 11:05:57 pm EDT with the same camera and settings as the first picture. The top of the trail (which is from another stage and was white in color) is approximately at 25° altitude. The residual smoke trail, taken at 11:06:18 pm EDT with the same camera and settings as the first two pictures. An airplane is entering the field of view near the left edge, just above the tree tops. The right end of the airplane streak points at the Stinger in Scorpius, the close pair of stars Shaula and Lesath. A close-up of the residual smoke trail cropped from the image above (mouseover for labels). At the time the picture was taken, Zubenelgenubi had an azimuth of 184° (4° past the meridian). On May 30, 2013, Jupiter, Venus and Mercury have continued to move farther apart, and Jupiter is becoming difficult to see as it gets closer to the sun. In this picture, it's lost in the clouds below Venus (but it was seen with 10x42 binoculars during the session). Mercury is climbing higher, but it's concurrently becoming dimmer (magnitude -0.4 tonight), so binoculars were needed to see it too. Venus, of course, was easy to see with the unaided eye. This image was taken at 9:00 pm EDT from Swede Run in Moorestown, NJ, with an older Canon Powershot G6 point-and-shoot camera, which was set to its maximum 29 mm focal length; exposure set manually to 1/10 second at f/3, ISO 400 (underexposed a bit, so lightening it up emphasized the noise). Handheld, but braced against the rear car door. By May 29, 2013, Jupiter, Venus and Mercury have moved apart, with Jupiter and Mercury on opposite sides of Venus compared to their positions in the initial picture of this series on May 21st. Magnitude -0.5 Mercury was 3.2° above Venus while magnitude -1.9 Jupiter was 1.6° below magnitude -3.9 Venus (mouseover for labels). Jupiter is only 15° from the sun now, and it will be at conjunction on June 19th. Taken from Swede Run in Moorestown, NJ, at 9:08 pm EDT with a Canon EOS 6D digital SLR camera and a Canon 70-200 mm f/2.8L USM zoom lens (on a fixed tripod) at 200 mm focal length. Exposed 1 second at f/5.6, ISO 800. 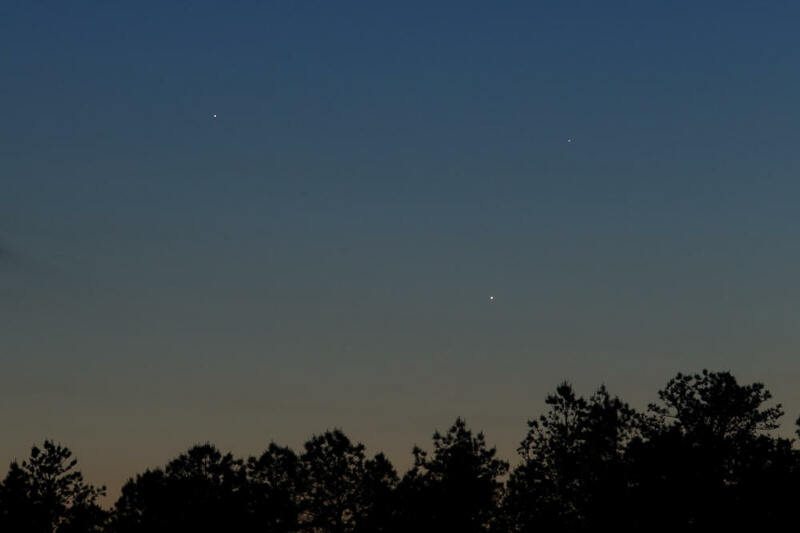 On May 26, 2013, Jupiter, Venus and Mercury converged to their tightest grouping of this triple conjunction. Seen here reflecting off Chatsworth Lake in Chatsworth, NJ, Jupiter (on the left) was 2.4° from Mercury (upper-right in the sky) and 2.0° from Venus (bottom right in the sky), while Venus and Mercury were 1.9° apart. Venus was at 2.6° altitude. Taken at 9:14 pm EDT (57 minutes after sunset) with a Canon EOS 6D digital SLR camera (on a fixed tripod) and a Canon 24-105 mm f/4L USM zoom lens at 105 mm focal length. Exposed 1.3 seconds at f/6.3, ISO 800. Click the image for a larger version. Here's a picture of me taking pictures at Chatsworth Lake. The image below is a close-up crop of the planets in the sky from the previous image. Zeta Tauri, the southern horn tip of Taurus the Bull, is now visible towards the left side of the frame. Mouseover for labels. On May 25, 2013, Jupiter, Venus and Mercury continued to converge after sunset — Jupiter was 3° from both Venus and Mercury, while Venus and Mercury were 1.5 degrees apart, and all three fit easily in a binocular field of view. This image was captured at 9:00 pm EDT from Carranza Field in Wharton State Forest, NJ (where all three were easily seen with the unaided eye), using a Canon EOS 6D digital SLR camera and a Canon 70-200 mm f/2.8L USM zoom lens (on a fixed tripod) at 200 mm focal length, then cropped to two-thirds the original size. Exposed 1/4 second at f/8, ISO 800. The following image shows the sky towards the setting sun at 8:09 pm, about 7 minutes before sunset. The azimuth of the sun behind the trees in the picture is essentially the same as Venus when it reached the tree tops at 9:05 pm (298° at an altitude of 4°). Taken with the 6D and the zoom lens set to 24 mm focal length. On the way to the field, I stopped at the Skit Branch bridge on Carranza Road where I found the Pink Lady Slipper in bloom and the Turkey Beard was just starting to flower. Click here for photos. On May 21, 2013, Jupiter, Venus and Mercury were converging in the western twilight. The picture above was taken from Swede Run, a Green Acres site in Moorestown, NJ, at 8:58 pm (44 minutes after sunset) and is very similar to the naked-eye appearance, showing Jupiter in the upper-left, 6.8° from Venus at the bottom-middle, and Mercury, barely visible 2.5° below-right of Venus. Taken with a Canon EOS 6D digital SLR camera (on a fixed tripod) and a Canon 24-105 mm f/4L USM zoom lens at 105 mm focal length. The picture above is cropped to two-thirds of the original size, while the picture below is the same one cropped to one-third the original size, so Mercury is more readily visible (mouseover for labels). Auto-exposed 1/2 second at f/4, ISO 800 (with auto white balance). Besides cropping and size reduction for this web page, no processing was applied. On May 12, 2013, the three-day-old crescent moon was 6° from the planet Jupiter as they straddled the center-city Philadelphia skyline, the moon at 12° altitude and Jupiter at 10° altitude in the west-northwest. Both objects are in the constellation of Taurus the Bull, and Zeta Tauri, the southern horn tip of Taurus, is faintly visible just above-right of the moon. While the moon is waxing as it moves eastward, Jupiter is now sinking in the west after sunset as it approaches conjunction with the sun on June 19th. This image was captured at 9:17 pm EDT from Cooper River Park in Collingswood, NJ, using a Canon EOS 6D digital SLR camera and a Canon 70-200 mm f/2.8L USM zoom lens (on a fixed tripod) at 100 mm focal length (then cropped). Exposed 1/4 second at f/5.6, ISO 3200. Click the image for a larger version. Click here for a series of images leading up to this one. On May 1, 2013, Venus was spotted with the unaided eye from the Maple Shade, NJ, baseball field complex at 7:58 pm EDT, three minutes after sunset, for the first time since superior conjunction on March 28th. This image was captured at 8:15 pm with a Canon EOS 6D digital SLR camera (on a fixed tripod) and a Canon 24-105 mm f/4L USM zoom lens at 105 mm focal length (then cropped to one-third the original size). Exposed 1/100 second at f/4, ISO 160. Mouseover for label. On April 25, 2013, we opened Camp Ockanickon's Tatem Observatory in Medford, NJ, for the young campers (the brown structure in the left background is the west wall of the observatory; the roof has been rolled off to the left). Since it was such a clear night, I decided to look for Venus before the night's activities began. Venus reached superior conjunction on March 28, 2013, and I hadn't seen it since the morning of January 20, 2013, at the Pennsauken Mart. Using my 16x70 binoculars, pictured above resting on a folded towel at the top of a photo tripod, I spotted Venus at 7:28 pm EDT (20 minutes before sunset at Tatem) when it was at 9½° altitude and 7½° solar elongation. Venus was subsequently seen with 10x42 binoculars too, but not the unaided eye. This picture was taken at 7:38 pm with a Canon 6D digital SLR camera and a Sigma 14 mm lens (Nikon mount with a Fotodiox adapter). Exposed 1/30 second at f/5.6, ISO 400.